Activity: Investigating a research problem; identifying a "mechanism"
Please read the instructions for the Quantitative Research Project: Climate and Human Behavior. Your submission for this activity may be applied to this project. Instructions for completing this activity will be presented in class. For this activity, please write the first four paragraphs of the Research Project. The instructions are repeated below. Your research question involves only the data provided on the project page. 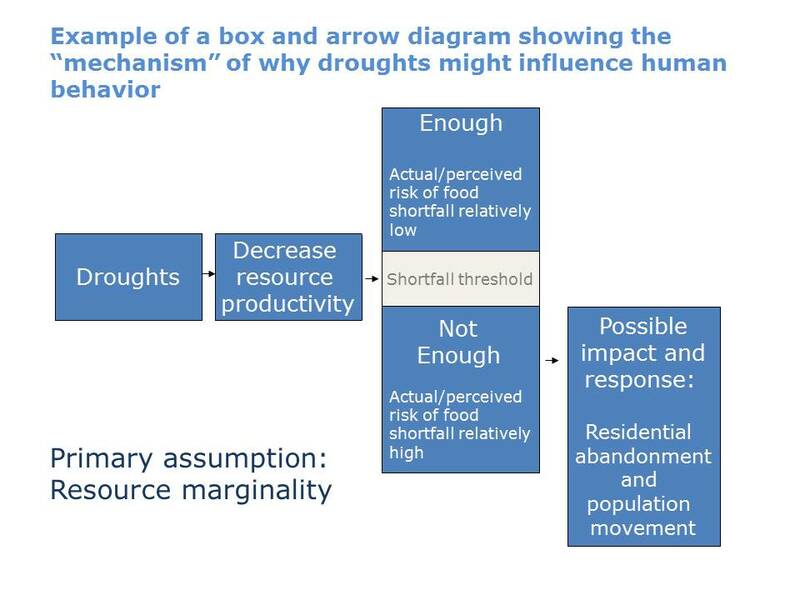 A simple way to state your question is: "What was the influence of x (independent variable, such as drought severity) on y (dependent variable, such as the percent of rooms abandoned during the period of study, 1200 to 1450). Thus, a reasonable research question is, "What was the influence of drought severity on changes in the percent of rooms abandoned during the 1200 to 1450 period?" Another research question is, "What was the influence of drought severity on changes in the number of archaeologically identified rooms." I recommend you select one of these two questions to investigate. This activity should require no more than 2, double-spaced pages. Separate the four sections by separate headings (Introduction, Background, Expectations, Mechanisms). This helps the reader follow the flow of your emerging argument. Please carefully proof read your document. Grammatical and spelling errors threaten understanding. Readers are not convinced by what they don't understand. Upload the activity on Blackboard, as usual.